Land evaluation is the prediction of land performance over time under specific uses. These predictions are then used to guide strategic land-use decisions. Modern land evaluation has a 30-year history, yet the results are generally accepted to be disappointing. Land users and planners are inclined to ignore land evaluators, reflecting the poor quality and low relevance of many actual land evaluations, as well as poor communication with users. The main objective of this research was to improve use and usefulness of information for rural land use decisions based on an operational demand-driven approach for land evaluation with case studies in Santa Catarina State, Brazil. First, the use and usefulness of soil surveys and land evaluation reports to land use planners were described and quantified and the relation between latent demand and actual supply was observed. Then, the farmers’ decision environment and its implications for land evaluation were studied. These were the basis for the subsequent steps of this research. Next, the applicability of a data-intensive distributed environmental model (AgNPS) in a relatively data-poor environment was evaluated. This model and other tools for visualization of scenarios were used with community participation, to test their effects on collective understanding of shared environmental problems. Finally, the potential of a participatory approach for integrating risk analysis into decision making for rural land use was evaluated. This research showed that a demand-driven approach to make the information more relevant and useful to rural decision makers for land use planning is possible in practice and should be further explored, but its effectiveness needs time to be confirmed. 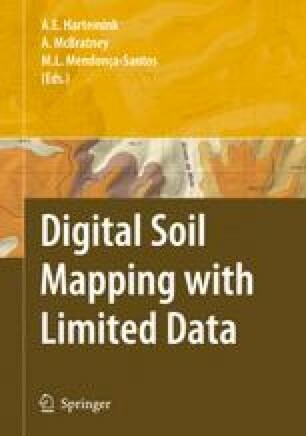 Applying the proposed approach, new demands were raised and considering that the number of soil scientists and financial resources are scarce in the region, digital soil mapping based on existing data emerges as a potential alternative to help to answer to the increasing rural decision makers demands.